SEOUL, Nov. 15 (Yonhap) — South Korea criticized Japan’s top diplomat Thursday for his unrelenting verbal attacks against a recent Seoul court ruling in favor of wartime forced labor victims. The trade of overt government-level accusations highlights a deepening rift between the neighboring countries following the Supreme Court’s verdict on Oct. 30. Concluding a lawsuit filed by four South Korean victims nearly 14 years ago, the court acknowledged their individual rights to compensation for Japan’s crime against humanity during World War II. Korea was under its brutal colonial rule from 1910-45. The court ordered Nippon Steel & Sumitomo Metal Corp., a Japanese steelmaker, to pay each victim 100 million won (US$88,500). While the South Korean government said it respects the ruling, Japanese leaders were critical of it. They claimed all reparation issues related to the colonization were resolved in a 1965 state-to-state deal to normalize bilateral diplomatic relations. There are similar suits, filed by Koreans against Japan’s wartime wrongdoings, awaiting rulings. Speaking at a parliamentary session in Tokyo on Wednesday, Foreign Minister Taro Kono argued the verdict is to “upend the legal foundation of relations between the two nations from the root,” according to local media. He warned Seoul-Tokyo ties will be “very thorny” unless Seoul deals with the issue in an appropriate manner. 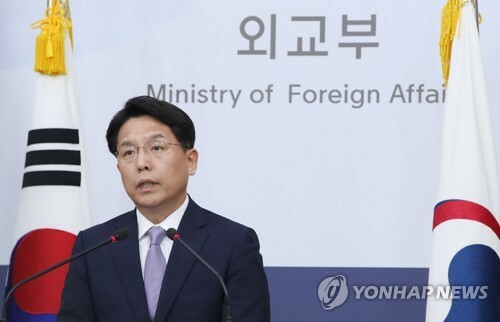 Seoul’s foreign ministry again expressed regret over Kono’s continued criticism of the judicial decision. “Our government can’t contain its disappointment,” spokesman Noh Kyu-duk said in a statement. Seoul has repeatedly asked Tokyo to cope wisely with the matter so as not to hamper the future-oriented development of bilateral relations, he stressed. “We would like to point out strictly once again that the Japanese government’s conduct, which goes on nonetheless, is of no help at all to resolving the problem,” Noh said. Hours earlier, the Japanese embassy in Seoul convened a meeting with the representatives of Japanese firms operating in South Korea for a closed-door briefing. “The Japanese government’s consistent position, as stated in various opportunities, is that (the matter) was completely and finally settled in the 1965 accord,” Kohei Maruyama, a minister at the embassy, said at the opening of the session briefly open to media. He added his government will continue to cope with the situation via close cooperation with the civilian sector. More than 100 representatives from around 70 Japanese companies belonging to the Seoul Japan Club attended the forum. It was not immediately confirmed whether those from firms involved in related lawsuits took part. He read out a part of Prime Minister Lee Nak-yon’s Nov. 7 statement, in which Lee said it’s the very foundation of democracy for an administration to accede to an independent court ruling.